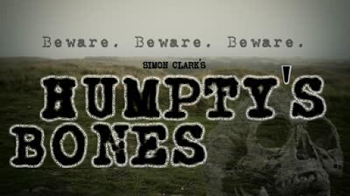 ‘Humpty’s Bones’ started as a novella by Yorkshire writer Simon Clark and has been developed for the stage by Sean Mason, with the approving blessing of the author, having been first performed two years ago. Interestingly, the inspiration for the story came from what appeared to be an old grave in the garden of the house in which Simon Clark grew up. Apparently, it was not at all uncommon for farms in Yorkshire to have small private cemeteries in the corner of a yard for past family members and for me, the dark, austere atmosphere of the pub room in which the play was performed helped convey the feeling of an old Yorkshire farmhouse, presumably isolated on the moors. The atmosphere starts off innocently enough, when Eden, a young woman on her way to stay at her aunt’s house in the country, encounters a local senior citizen called Ada whilst waiting for a bus. When their conversation ends with the older woman warning ‘beware… beware… beware!’ something tells you that there is something untoward in the house on the hill. After a setting a scene of foreboding, the atmosphere becomes relaxed as Eden settles into her new surroundings. Considering the limitations of the small upstairs stage area at the Seven Oaks, the setting was reasonably convincing as the kitchen in an old house that has been turned into a makeshift archaeological examination room. The main characters are well drawn as we are introduced to the calm and studious Heather and her irritable husband Curtis, with Ada as all-knowing who keeps returning to give more dire warnings. The story revisits the well-worn format of dangerous spiritual consequences ensuing after the disturbance of ancient graves for historical and research purposes. However, this is not a simple re-working of ‘The curse of the mummy’s tomb’ but a modern story with a very original back-story to the human remains that are unearthed. The fractured relationships between the husband and wife and their different reactions to their guest stand over and above the unfolding supernatural horror and Ada serves to give everything that happens a local slant, coupled with time-worn wisdom. Lauron Stirrup gives Heather an almost playful innocence in contrast to the various angsts of her husband, Curtis, played with convincing agitation and growing aggression by Andrew Marsden. Pat Brocklehurst as Ada brings a well-observed sense of a concerned wise-old-head, desperately trying to warn young people of the unforeseen consequences of their actions. It was a shame that at times, she was let down by clichéd dialogue (her character could express herself well enough I am sure without the need to act at times like one of the witches in Macbeth). Eden, the main character, goes through a range of disturbing realisations as Cathryn Philbin brings a genuine sense of anxiety and fear to her character, having first come over as cool and confident. The atmosphere builds up steadily and good use of sound effects gives a real sense of ‘something being out there’. Developing into a gritty climax, what did not work for me was that after one of the characters (I won’t say which one) suffers a brutal death, the atmosphere becomes calm very quickly in spite of the presence of a bleeding corpse on the floor but the explanation at the end is both interesting and unexpected. Overall, a supernatural story with some original takes and as a single-act play - a nice introduction to a Halloween evening of spookiness. The play was presented by Scytheplays Ltd.